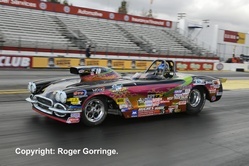 The 52nd Annual O'Reilly Auto Parts NHRA Winternationals presented by Super Start Batteries starts the Full Throttle Countdown to the Championship Drag Racing Series for the professional classes and the NHRA Lucas Oil Drag Racing Series for Sportsman, and Pomona was the place to be. 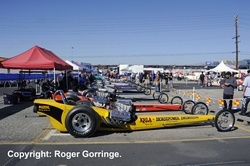 The whole world of drag racing was looking forward to this season's start but looking at the entry list a couple of weeks prior to the event gave cause for concern as there were only a few on view. 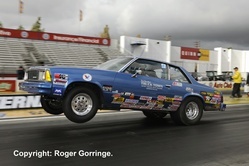 However, there was no need to worry, with NHRA predicting a fine four day forecast and final listings in Top Fuel topping eighteen, Funny Car a whopping twenty and Pro Stock eighteen the fans were not disappointed. The weather ranged from balmy mid eighty degree temperatures to chilly high forties Fahrenheit with one torrential rain storm negating the last qualifying session. 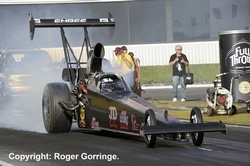 Top Fuel, the kings of the sport, witnessed last year's event winner Morgan Lucas putting a stranglehold on qualifying with an opening burst of 3.832/320 that was bettered in round three before the rain to a 3.783/325 with Spencer Massey at two, 3.820/325, Bob Vandergriff at three on a 3.832/322, Antron Brown fourth with a 3.833/322 and Branden Bernstein on a final posting of 3.836/308 for fifth leaving Rod Fuller on the bubble with a 9.343/74. No huge surprises in round one with wins going to Clay Millican over Khalid alBalooshi, Shawn Langdon over Steve Torrence, Brandon Bernstein beating Dave Grubnic, Antron Brown seeing off Cory McClenathan, Morgan Lucas over Rod Fuller, Bob Vandergriff took out Terry McMillen, Spencer Massey trailering Steve Faria and Tony Schumacher winning against Doug Kalitta. 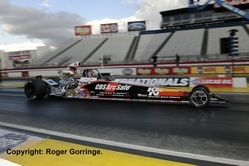 Round two witnessed top qualifier Morgan Lucas winning by a nose in a great drag race over Shawn Langdon, 3.792/323 against the losing 3.791/319. 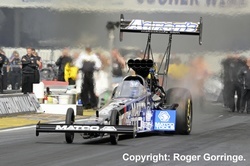 Brandon Bernstein went into instant tyre smoke slowing to a 10 dead as Antron Brown carded a great, close to the centre line 3.771/323 for the win. 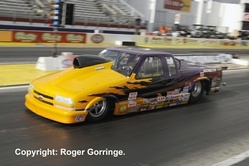 Bob Vandergriff's good year start was ended by Tony Schumacher as the 3.790/324 beat the 3.815/323. Spencer Massey continued to impress with a slight lead turning into a win against Clay Millican, 3.776/326 to a losing 3.847/315. The semis showed three Don Schumacher Racing machines in the chase and it was Spencer Massey that led the way against team owner's son Tony Schumacher, a wheels up second quickest time of 3.745 at a fastest-ever speed of 328.62mph over the one thousand foot track put Massey in the final as Schumacher's 3.809/322 failed to catch up. The last of the DSR cars had Antron Brown face Morgan Lucas and it was Brown's 3.819/320 that got the win as Lucas slowed with problems at half track. An all DSR final pitted young gun Spencer Massey in the FRAM/Prestone car against the Aaron's/Matco Tools machine of Antron Brown and despite a good holeshot coupled with a 3.794/320 Brown lost as Massey charged past with a winning 3.750/325. 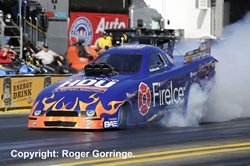 There were three qualifying leaders during the Funny Car qualifying battles starting with Jack Beckman on a 4.139/308 then Bob Tasca III ran a 4.109/309 but it was Robert Hight that held the last try bettering things with a great 4.060/316, this put Beckman into second place followed by Johnny Gray on a 4.098/313, Mike Neff at 4.103/307 for fourth and Bob Tasca III his 4.109 ticket. Sitting on the bump spot was Canadian racer Todd Lesenko with a 4.306/277. DNQs included Cruz Pedregon and Jim Head whilst in twentieth place an embarrassed James Day who took the unenviable credit for the worst oildown the Safety Safari had ever seen. All eyes were on the new name in the class, one Courtney Force who on her début recorded a twelfth place in qualifying with a 4.199/307. Round one losers included Jeff Arend to Gary Densham, Johnny Gray to Tim Wilkerson, Bob Bode to Jack Beckman, Robert Hight to a jubilant Todd Lesenko who had hazed the slicks and got close to the wall but won. 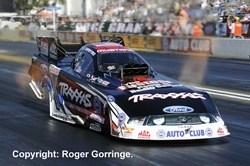 Tony Pedregon lost to Mike Neff whilst Bob Tasca lost giving Courtney Force her first round win. 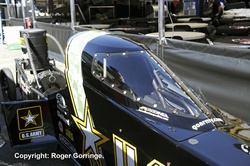 Alexis DeJoria lost to John Force in a close call and ending the round, out went Champion Matt Hagan to Ron Capps. 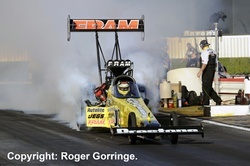 A bizarre occurrence took place in the opening pair as Jack Beckman who was ahead of Gary Densham suddenly ended up in his lane, the pair just lightly colliding nose to tail but giving the win to Densham. 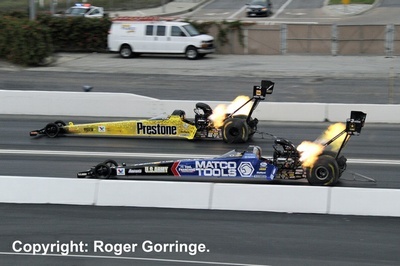 Todd Lesenko's weekend ended in shake and tyre smoke that deployed the chutes coasting him to a lose as Ron Capps' 4.086/311 got the light. It was Courtney Force's turn next to go away with the lose as her 4.143/313 was not enough to catch teammate Mike Neff's 4.070/315. The final pair had John Force lead the way with a holeshot 4.160/311 as Tim Wilkerson chased, losing with a slowing 4.574/208. Gary Densham's wounded machine red lit away his chances as he faced John Force in the semi final, a 4.141/312 was Force's winning number. 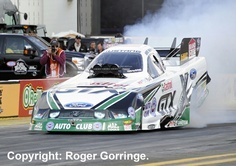 A close race followed with Mike Neff passing Ron Capps to take the light with a 4.074/314 to the losing 4.101/308. 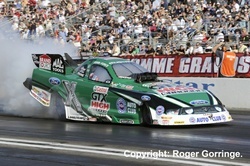 An all John Force Racing final ensued as Force in the Castrol GTX High Mileage Ford Mustang took the event win with a 4.080/315 as Mike Neff made a somewhat somnolent leave recording a chasing 4.036/316 in the Castrol GTX Mustang. Mike Edwards took the two initial Pro Stock qualifying top spots with a 6.545/211 but was topped in the third and final session by Champion Jason Line with a 6.535/212 putting Edwards into second ahead of Ronnie Humphrey on a 6.548/211 then Allen Johnson with a 6.548/21 and Greg Anderson on a 6.556/211. 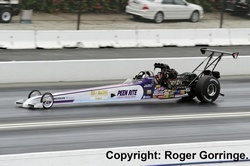 On the bubble was Grace Howell with a 7.486/142 and DNQs were Warren Johnson and Steve Kent. Winners in round one included Shane Gray over Ron Krisher, Rodger Brogdon beating Kurt Johnson in a close race, Vincent Nobile over Greg Stanfield, Jeg Coughlin Jr winning against Ronnie Humphrey. Greg Anderson put Larry Morgan in the trailer as Mike Edwards beat V Gaines. 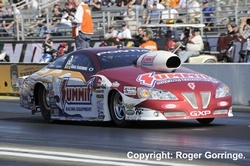 Jason Line beat an improving Grace Howell and Allen Johnson took out the other lady Erica Enders who red lit. 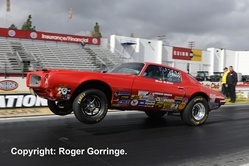 Mike Edwards opened round two with a defeat of Roger Brogdon, a superb holeshot 6.575/210 beating the 6.658/189. 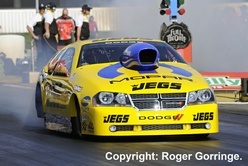 Vince Nobile left first but was run down and beaten by Jeg Coughlin Jr who took it by a nose, 6.590/209 to a losing 6.609/209. 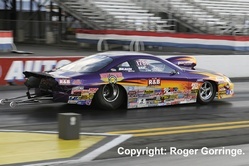 A red light ended Shane Gray's weekend as his 6.594/209 was of no use as Jason Line got the nod with a winning 6.534/212. 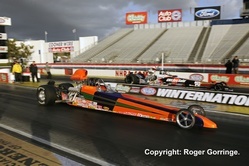 Greg Anderson finally beat Allen Johnson in a close race that had the 6.550/210 from Anderson take the light as the 6.570/210 lost. In the semis it was Mike Edwards turn to beat the tree, a red light 6.590/209 was all to no avail as Jeg Coughlin Jr's 6.615/209 took the win. An all team race pitted Greg Anderson against Jason Line and it was Anderson's holeshot that got the win coupled with a 6.545/211 as Line chased in vain losing with a 6.547/211. The final was a race of the speedshop cars, Greg Anderson in the Summit Racing Equipment '10 GXP against the Jegs.com/Mopar '12 Avenger driven by Jeg Coughlin Jr. Coughlin left first but was reeled in by Anderson who took the win with a 6.549/210 to the losing 6.586/209. Top Alcohol Dragster came down to a race between a blown car and an injected machine with Chris Demke's blown Peen-Rite/Cleanboost Oil car carding the win with a 5.281/270 as Larry Miersch, with Eurodragster.com sponsor Derek Flynn in attendance, was chased down and beaten, losing with a 5.503/267. 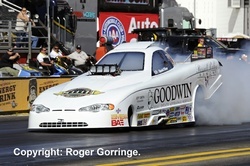 Top Alcohol Funny Car saw Daniel Oliver take the win with the Randy Goodwin Racing Monte Carlo, a 5.531/258 beat Jay Payne's try of 5.548/260. The Competition Eliminator win went to multiple winner Dan Fletcher in his '08 Cobalt, an 11.902/74 was enough to beat the red light time of Randy Jones in his '01 S-10 truck. Super Comp saw the win going to Kevin Wright, a good light coupled with a 10.129/101 saw off the 9.324/123 try from Tommy Phillips. 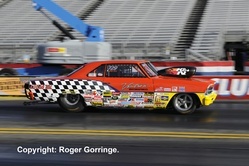 Super Gas had Greg Ventura take his '66 Nova to the winners' circle when his 9.926/141 beat the 9.932/155 from Jimmy Lewis in his '58 Corvette. 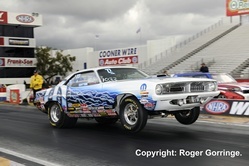 In Super Stock Mike Cotten took the trophy with his beautiful 1970 Barracuda, a 10.242/120 got the better of the 10.851/119 from Jody Lang in the '81 Malibu. 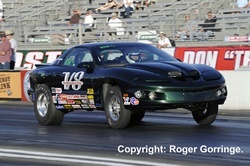 Stock Eliminator was the only class to have any European participation and it came from Finland's Editor-in-Chief of V8 Magazine Jarmo Markkanen in his new acquisition, an ex-Jim Waldo '02 Firebird. 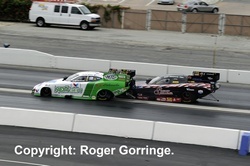 Jarmo's luck did not last past round one when he was beaten by a red light against Toby Lang. 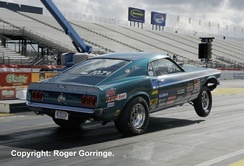 Brad Burton driving a '72 Formula took the event win with a 10.816/118 beating the 10.750/123 from Don Keen's '69 Mustang.